Discover our stunning range of Ponte Vecchio jewellery recognised around the world for its fine Italian craftsmanship, colourful gemstones and precious diamonds. The story of Ponte Vecchio jewellery is enchanting, starting on the Ponte Vecchio bridge in Florence where founder Ugo Cala worked in his father’s barber shop and built relationships with the clients who were expert craftsmen and goldsmiths. Their luxury jewellery collections include Love Promise, Iside, Classico, Vega, Nobile and Love Lock, a range of gold jewellery inspired by the locks chained on Ponte Vecchio bridge as a symbol of eternal love. 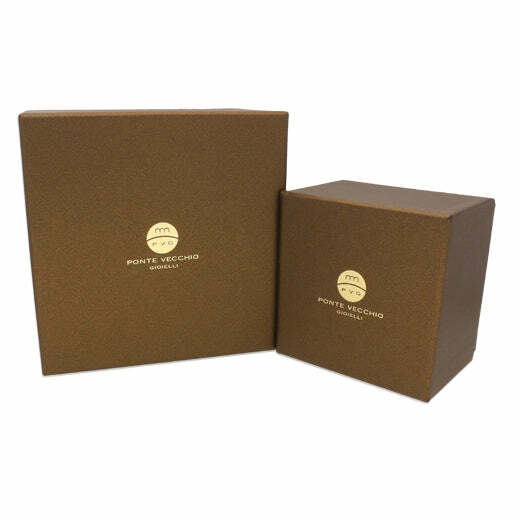 We are official stockists of Ponte Vecchio jewellery with Ponte Vecchio necklaces, Ponte Vecchio bracelets, Ponte Vecchio rings, Ponte Vecchio bangles and Ponte Vecchio earrings all available online and in store with interest free finance and free UK delivery. Ponte Vecchio Nobile 18ct Yellow Gold Diamond Bangle, CB1151BRY-N. Contemporary and luxurious, this stunning bangle features a woven design which has been created using 18ct yellow gold. The bangle is further embellished with sparkling brilliant cut diamonds, totalling 0.08cts, which are set within an 18ct white gold crossover design. Designed perfectly for everyday wear, this diamond set bangle is flexible for easy wear.